Hard-to-Find and mostly available through dealerships. These world renowned Japanese Stanley Brand lamps are designed to insert directly into the dashboard circuit boards on Japanese cars and trucks. Also used for control knobs and handles, these specially designed bulbs are manufactured with at least one filament support which minimizes vibration. The result is an extremely long life when compared to the original equipment. 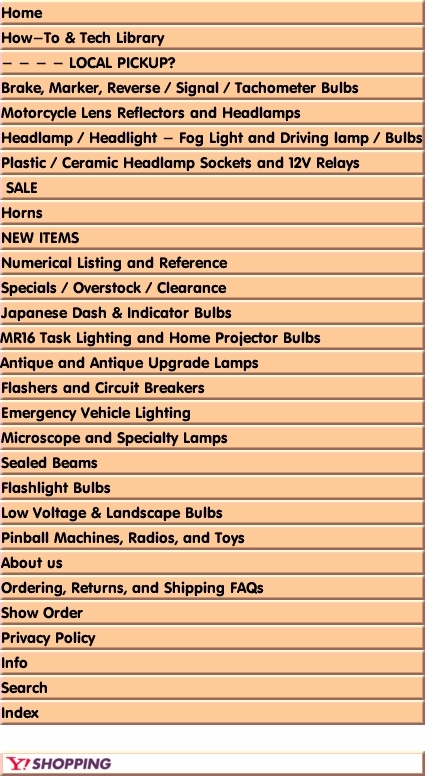 ALL PRICES ARE FOR A TEN (10) PACK OF BULBS!!! KT888 14.0 1.4W T4.7 (Gray Base) - Available as a 10 pack only. - Switch Lights / Dashboard Panel / Slide control switches. KT925 14.0 100mA T4.2 (White Base) - Available as a 10 pack only. - Accesory Warning Lights. Battery, Brakes, Oil Pressure, Door Open and more.